Introducing a proven, eco-friendly water treatment program that reduces chemical dependency and the cost of boiler operation.Used in Japan for years, these chemicals are ideal for your Miura once-through boiler. We are so confident in this product that we will guarantee your Pressure Vessel against failure due to corrosion, when you use it. 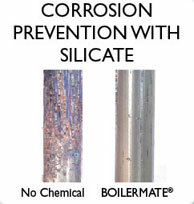 The main ingredient of Miura’s BOILERMATE® is Silicate, a corrosion inhibitor. Silicate is naturally-occurring material ideal for water treatment in Miura’s once-through boilers. Years of research and experience have shown that water tube corrosion can be controlled by balancing the amount of silicate in the water and the corrosive ions. BOILERMATE® users can greatly reduce the need to heat feed water, usually eliminating the need for an expensive Deaerator. This is a remarkable and unique advantage that saves money on costly equipment ‘extras’, while also reducing energy costs and conserving resources. 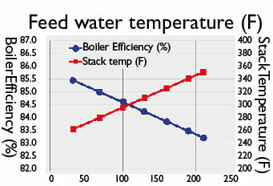 By operating the boiler at lower feed water temperatures, users will benefit substantially from improved overall efficiency, depending on the condition of their water. Proven Performance. So Good It’s Guaranteed! Used for many years in Japan, the BOILERMATE® silicate-based solution has been proven to substantially lower the rate of tube failure compared to traditional chemicals. In fact, BOILERMATE® is so good Miura guarantees the Pressure Vessel and Economizer against failure due to rust and corrosion*. 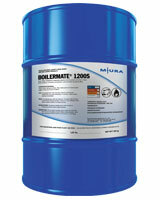 Miura’s BOILERMATE® is just one more reason to “Think Green and Save Green” with Miura boilers. *(Based on the condition of the customer’s water, usage, and facilities, tube failure may still be possible.) For MMC/MMRC customers who use BOILERMATE®, Miura will repair or replace the Pressure Vessel and Economizer at no cost. Miura’s MI Controllers turn your boilers on and off (in Multiple Installation) according to load demands. 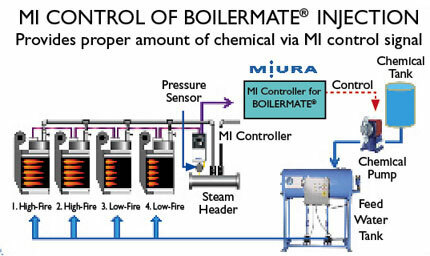 Miura’s MI BOILERMATE® Controller works in conjunction with the MI Controller to intelligently regulate the pumping of chemicals based on boiler operation. Smarter operation reduces chemical waste and associated costs. Competitors do not offer this option and since high or low amounts of their sulfites can lead to rust, corrosion, and worse… on-site monitoring/adjustments are critical… and costly. Miura’s ‘once-through’ boilers produce steam in less than 5 minutes, an enormous advantage that saves money and conserves resources. 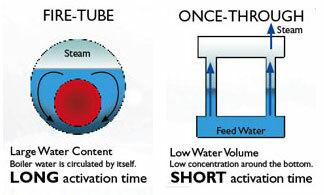 Once-through boiler’s start fast and achieve steam quickly (in 1/10 of the time of a conventional fire/water tube boiler). Traditional Sulfite chemical water treatment needs time and added heat to activate with oxygen, and typically requires much longer preparation time (depending on water conditions and usage). Miura’s BOILERMATE® uses Silicate that creates a film on the water tube surface and doesn’t need time to activate, making it more suitable for once-through boilers. BOILERMATE® is easier to use and helps to extend the life of the boiler.